The Danish royal family holds an annual summer photocall in the gardens at Gråsten Palace, their summer residence. This year's photocall took a little different format, featuring just Queen Margrethe, Crown Prince Frederik, Crown Princess Mary, and their four kids watching the Ringsted Horse Ceremony outside the palace. It was a rainy, dreary day, and any potential sartorial triumphs (oh how I usually love Crown Princess Mary in her boho maxi skirts) were fairly foiled by the need for coats. This is not a problem, however, when your raincoat is designed to be the star of the show. Queen Margrethe loooooooves her floral coat with its cheery yellow trim and its matching yellow Sou'wester-style hat. Most raincoats are boring and this Danish sovereign is anything but, so she wears what she calls the "happy" raincoat. It's always an unexpectedly exuberant statement, standing out in a sea of sedate royal rain gear or on a parade field surrounded by military uniforms. It's a true signature Margrethe piece. The raincoat even has a backstory, because you know she didn't just happen upon this creation in a shop somewhere one day. She took her festive fabric purchase to Jørgen Bender - the couturier responsible for multiple royal wedding gowns, epic royal gala looks, and...the occasional royal foul weather gear - to have it fashioned into a raincoat, which of course she had a hand in designing. It was made in 1995 and has been a famous part of the Queen's wardrobe ever since. 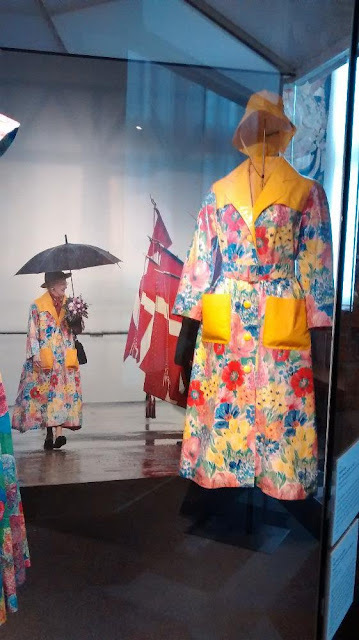 The coat and hat were even included in an exhibition of Margrethe's wardrobe staged in honor of her 75th birthday. Things like this really show how much fun Queen Margrethe has with her often over-the-top wardrobe. There's a sense of humor here, too. You get the feeling that she actually does a little bounce of joy when she sees the rain begin to fall, for she'll have another chance to sport the jolliest raincoat in all the land. It's just so perfectly Daisy, no?